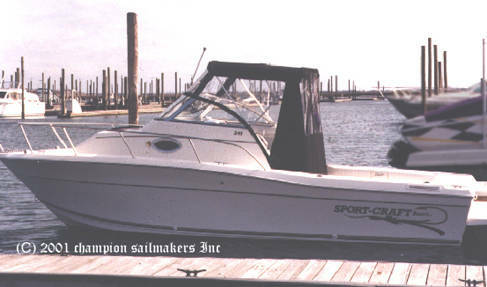 This 2000, 241 Sport-Craft shows a bimini top and enclosure. The design began with a contemporary, flat style bimini top constructed on a heavy duty .065 wall aluminum frame. It has standing rods that allow the top to be folded in the popular rear 'radar arch' position. Since the front windshield is a two peice design, I followed it through to the front clear connector. Each section can be rolled up with straps. Also followed was the rake of the clear connector. Side curtains also taper inwards to match the design of the boat. A three piece drop curtain completes the package. Two zippers and three window permit the 'door' section to be rolled up. This Sport-Craft was brought up from the factory without factory canvas by a local dealer. The dealer wanted all the boats he sold to have an edge over other dealers in the area, so Champion Sailmakers was called in.